You may have recently received a quarterly statement from your wealth manager or 401K provider and discovered that your low risk portfolio lost value. Many well managed funds experienced a similar dip. This dip was “special” and it may signal a transition to a new market regime. I’ll explain the drop, why it was special, and why there may be more dips like this until the transition is complete. If your investments are managed by a wealth manager you likely hold a diversified portfolio that is designed to reduce risk. If your manager is good, he or she probably uses some sort of asset allocation or risk parity method for deciding how much should be invested in each asset. Unfortunately, many such strategies lost value in May and June 2013. The loss may have come as a surprise to you because these types of management techniques are usually quite stable even if their overall returns are reduced compared to more risky strategies. All managers of diversified portfolios use a blend of bonds and stocks, but their strategies differ according to how they choose to allocate funds between those assets. It is the complex relationship between stocks and bonds that explains the recent drawdown. For this discussion, the distinctions between allocation strategies used by fund managers are not important. 2013 Year to Date performance for The Cambria Global Tactical Fund (GTAA) and two of AQR’s Risk Parity Funds (QRHIX and QRMIX). Note the decline in May and June. The AQR Risk Parity MV fund: -3.5% in May and -9.0% in June. Overall -2.85% for the year. Their Risk Parity HV fund suffered similar losses and was -4.79% for the year. These funds are available as QRMIX and QRHIX. Cambria Global Tactical Fund (GTAA): -3.8% in May, -3.4% in June and +0.74% year to date. The StumpGrinder strategy I direct was also down in May and June, and down slightly for the year (more analysis on StumpGrinder to come in a separate blog). That article was referring to the Bridgewater strategy, but the rationale for the drop applies to all the funds I listed above. An important reason these sorts of funds work well — and by that I mean low volatility and steady returns — is because they include assets whose returns are anti-correlated. Anti-correlated sounds like a complicated term, but its meaning is simple: When one asset zigs, the other zags. 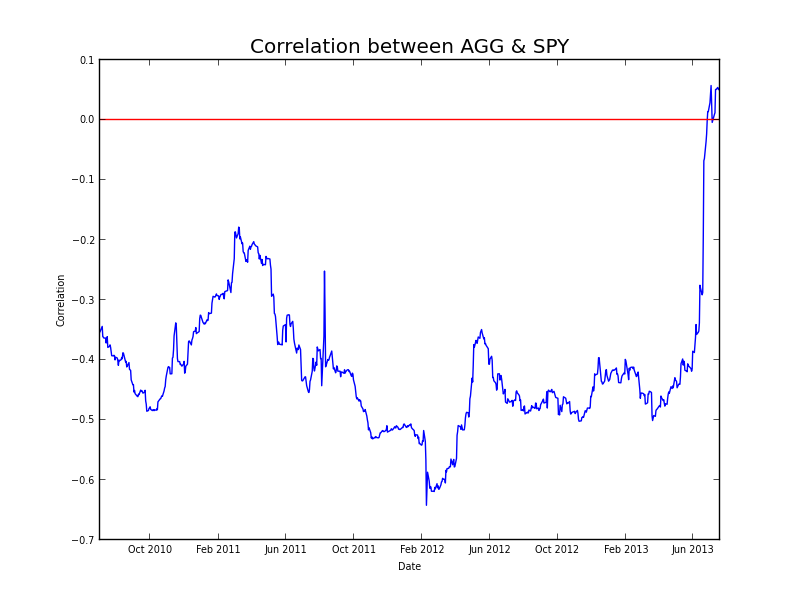 Historical correlation of bonds (represented by AGG) and stocks (represented by SPY). These assets are usually anti-correlated (correlation is negative). Note the recent spike up in correlation that began in April 2013. Historically, bonds and stocks are anti-correlated (see chart), but they also both provide generally positive return in the long run. The combination of anti-correlation and positive return is key: It provides stable performance with low volatility. In May and June 2013 the major components of most asset allocation funds lost value: U.S. bond prices fell significantly along with international bonds and stocks. U.S. equities were the only source of positive return during this period, and even then only slightly positive. The overall market (S&P 500) was up, but low volatility stocks — the type often used in asset allocation strategies — were down significantly during this period. Even with that volatility, for many investors asset allocation is still the best game in town. Asset allocation strategies have strong track records through many tough historical periods and I expect that record to continue. However, until the Fed’s policy changes concretely, fund managers will have to think carefully about the instruments they use.